Sharing is caring! In this use-case I will describe all actions done to get my workflow working. In my case there are two roles: processowner and author. The processowner has the rights to iterate and checkout a bookpage. He or she then is able to share this item to someone who will get the author role. The author has the rights to set the workflow to ‘written’ when he is done. The processowner will checkin the page and it will return to the ‘concept’ state again. There is a contenttype called bookpage, which is just a normal document including some additional fields. 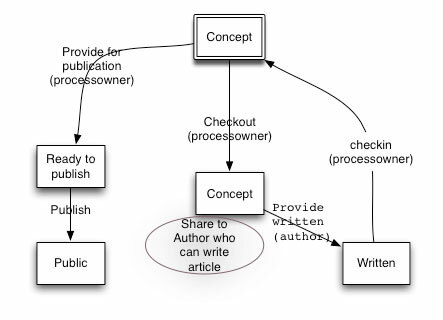 Below is a schema of the setup I need to create for my bookpage contenttype. First thing to do is to setup the iterate part. We need to add our ‘bookpage’ to versionable types. This can be done by editing the setuphandler.py and adding the following code. We also need to tell diff_tool to add our contenttype so history and iterate will work. One of the easiest ways to create a new workflow for my bookpage is to copy an existing workflow using the ZMI and rename it to whatever you want it to be. In our case we call it ‘book_workflow’. We do the same thing for Author and Manager on the Transition ‘Provide written’ so only the author can set the state ‘written’. Note: in the ZMI we can do the same thing. We need to use a semicolon as the seperaror. The processowners needs the rights to share the author role to someone, so we need to setup a permission ‘Delegate Author Role’. DelegateAuthorRole = "Sharing page: Delegate Author role"
title="Sharing page: Delegate Author role"
Tell include in configure.zcml we have done above. Setup the security settings for Processowner. He needs to get ‘Delegate Author role’ and ‘Delegate roles’ for showing the sharing tab. We can also set the rights for the author role using rolemap.xml. <permission name="Sharing page: Delegate Author role"
<permission name="Sharing page: Delegate roles"
Best thing to do is export you workflow and security settings using the ZMI. 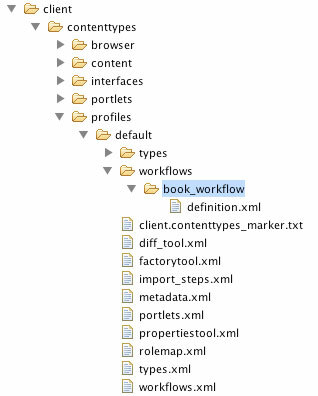 Go to the portal_setup tool where you can export all kinds of XML. Export ‘Workflow Tool’, ‘Placeful Workflow policies’ and ‘Role / Permission Map’ and put them in your contenttype profiles directory. We are now able to share the role Author at the sharing page in Plone. The Living Statues Sprint 2010 is over during which a lot of progress has been made.